EYC knows that we can’t create life-changing opportunities alone. To open the world to our students, we rely on an incredible network of partnerships including higher education institutions. The partnership we have with Pannasastra University of Cambodia (PUC) and Bridgewater State University (BSU) in Massachusetts epitomizes this. 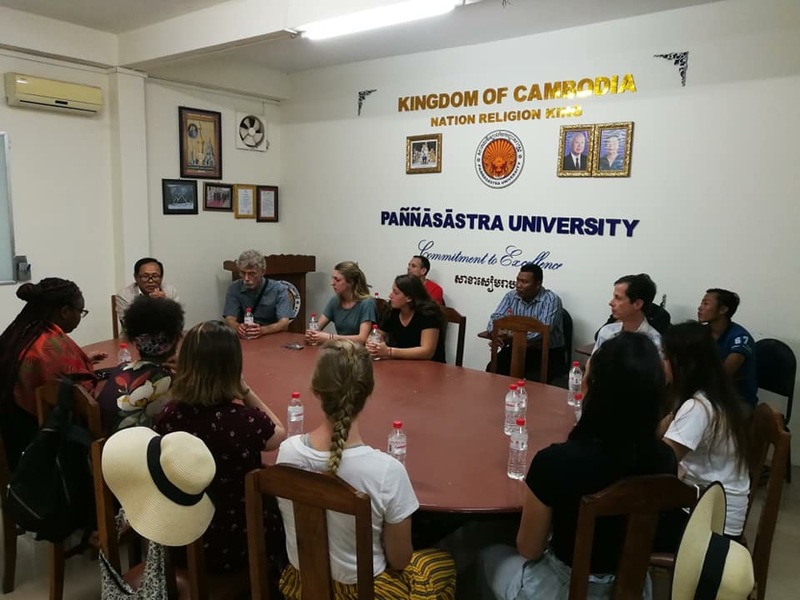 We are fortunate that these two universities believe in the importance of international exchange programs and have built a partnership creating opportunities for Cambodian students from PUC to study at BSU. In addition, these universities have opened up the chance for EYC students to apply to the exchange program by providing specific support and scholarships. Without this critical financial support, the reality of studying in the US would never be a possibility for EYC students. Acceptance into the program is a rigorous process. Students must meet the academic criteria, pass the English proficiency test, and provide detailed essay answers. They must also commit to coming back to Cambodia and making a difference for EYC and their larger community and country. The partnership between EYC and PUC started over a decade ago when Drew, EYC’s founder, visited Pannasastra High School with a few students to inquire about scholarships. After applying, a handful of students were accepted on a 50% scholarship, providing them with the chance to study at one of Cambodia’s top high schools. From there, some of these students continued their studies at Pannasastra University (PUC). The relationship with PUC has continued over the years, and it was through that relationship that EYC first connected with BSU. In 2009 – 2010, Dr. Kevin Curry, a BSU Professor of Aquatic Ecology was on a teaching fellowship from BSU and Rotary International at PUC. He visited EYC in 2010 and later brought BSU students for field study tours to volunteer at EYC schools. To this day, Dr. Curry continues to visit Cambodia annually with students working on water projects. In 2015, Dr. Ben Carson, Professor of English, expanded the annual field study trips with BSU students with an intensive study tour to teach English in EYC schools. These study tours take place annually in January. The partnership we have with PUC and BSU makes new opportunities possible for our students. We would like to thank the following individuals for their commitment and dedication to this partnership: President and Dr. Kohl Pheng, Vice President Long Khimheng, and Mr. Phoeung Narin, the Assistant Director of the International Study Program at PUC along with Dr. Kevin Curry, Dr. Ben Carson, Dr. Wing-kai To, Founding Assistant Provost for Global Engagement, Jen Currie, Associate Director International Student & Scholar Services and President Clark of BSU.